Need a break from all the introspection and self-analyzing journaling prompts? Many avid journalers and journal coaches (including myself) are happy to inculcate the therapeutic benefits of journaling. It’s true that journaling is among the most powerful tools for looking deep within, identifying buried dreams, and challenging your assumptions. But constantly examining one’s self, fishing for new insights, or trying on new perspectives can get exhausting. Sometimes it feels good just to play in your journal, and not have any particular outcome in mind. It’s important to declare a break from the heavy therapy and just write from whimsy and imagination. In fact, an entire movement called “Wreck This Journal” was started from this very premise. Our creativity gets stimulated. Our genius of imagination comes alive when we try new things just for the sake of it. We learn by playing. Just as children, when we learned important social skills and the laws of nature through games and play-time, we can still learn about ourselves and the world by having fun and being silly. Discover new talents and interests by following your curiosity. Who knows what new passions you might uncover?! What hidden strengths you might discover?! Open new patterns of thought. Playing in your journal, like waking a less-used section of your brain, can provide new troubleshooting techniques, even reveal new solutions to old problems. Write from bottom of the page to the top. Use different colors, or pencils, or crayons. Use pictures, or cut-outs from a magazine (collage). Write in ALL CAPITAL LETTERS, or write very large, or very small. Don’t keep within the lines. Focus first on favorite letters, choose a few each entry. Write in a different location than usual. It’s amazing what insights can come from the laundry room, or the dining room floor. Write about your day from your dog’s point of view. Write yourself a letter, or write someone else a letter. Write a completely made-up story about how your day went. Write a completely made-up story that sounds like a real journal entry from your life. Write from the back of the book to the front. Use only the top half of the page. Weeks or months later, come back and write a separate entry using the bottom half of the page to review and remark on what you wrote above. Write on random pages of your journal (instead of sequential). Write essentially the same journal entry every day for a week, using some different “voice” or attitude, or interpretation of the facts. Write in the dark, or with your eyes closed. Write any way that you want to, just DON’T NOT WRITE! Follow @Write4LifeCoach on Twitter and “Like” him on Facebook! This entry was posted in Journaling Tips on February 16, 2013 by Nathan Ohren. Toward the end of January, has your exciting New Year’s Resolution already run out of steam? It’s not your fault; this is normal. But instead of developing a sense of cynicism about resolutions, there are some pragmatic actions to jump-start (or re-start) the habit of journal-keeping. 1. Make a definite date with yourself. Reserve at least 30 minutes. Say tomorrow, at 3:35 pm. Or next Saturday, at 9:15 am. Look at your calendar, choose something you will keep without fail. Honor this appointment as you would if it were made with the most important person you can imagine (the President, your dream celebrity, whoever)! After all, it REALLY IS an appointment with your Highest Self! Set reminders, and schedule other appointments around it. 2. Use that appointment as your first new journaling session. In that journal entry, write down your plans for the next 30 days to build and maintain the journal-keeping habit. Will you make daily appointments with yourself? Write before you shower each morning? Choose some action plan inside that first appointment, and contract with yourself to follow it. Try not to spend too much time in the blame, shame, or guilt from the past. Instead, get present with your intentions to re-start, and why it is important to you. Then be practical and realistic in planning your follow-up. 3. Make a game: Count consecutive days of writing. See if you can reach 7, 10, 30, 60, or even 90 consecutive days of writing at least a full page in your journal. In my journal-writing courses, we often have a contest among the participants to see who can keep writing daily the longest without skipping a day. It is fun, friendly competition, and a great way to keep a tangible goal in view. 4. Get support: Join a journaling circle. There are several places to look for this. From as simple as subscribing to a journal-prompt feed (there are many on Twitter), to joining a group that uses textbooks (such as The Artist’s Way, by Julia Cameron, or the 27-Day Journaling Challenge by Mari L. McCarthy), to a simple buddy-system with a good friend. Having a sense of community, to exchange tips, or just to get that extra nudge of motivation can make a huge difference. Almost everyone who participates in my courses report that having a supportive group with a common goal was the single most important factor in keeping consistent in their journaling. 5. Expect obstacles, and make backup plans. There will be days when you get invited to a morning hike, or a birthday breakfast with friends, that thwart your best intentions of writing in the morning. Rather than allowing those days to interrupt your habit, reschedule your writing appointment for later in the same day. Or, make certain you jot down notes to include in your next journal entry, and allow yourself the extra time on the following day. 6: Make it fun and easy! If you’ve made a commitment to write for 30 minutes, or 3 pages each day, and you find that you are just not able to set aside that much, adjust your goals. Sometimes in the excitement of starting a journal-keeping habit, we pressure ourselves to write long, profound and interesting stories each day. Instead, give yourself permission to write just ONE page, or even just a few sentences that describe most important (or most unique) interaction in each day. Over time, your muse will help you build from there. 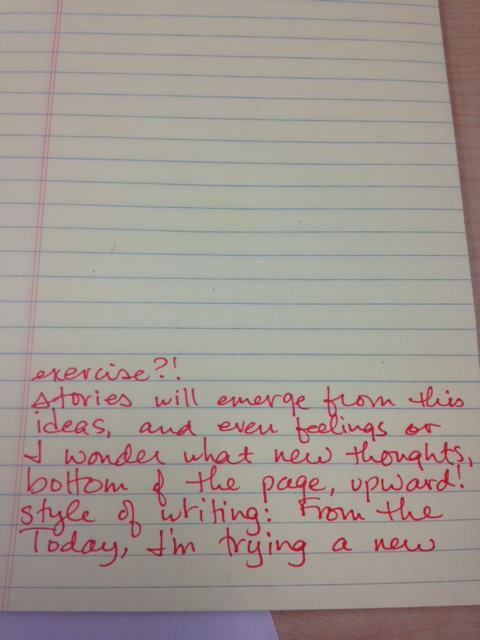 Also, you might try switching for a period of time to typing versus handwriting your journal entries (or vice-versa!) to see if one works better for you. This entry was posted in Journaling Tips on January 21, 2013 by Nathan Ohren.